C4 Demolition Services is an A Class Licensed company which allows us to remove both bonded & friable asbestos. The safety of our clients, the public and our workers is of paramount importance to us. Our staff have attained either CPCCDE3014A Remove Non-Friable Asbestos or CPCCDE3015A Remove Friable Asbestos qualifications & our Supervisors have attained CPCCBC4051A Supervise asbestos Removal qualification. Our staff are re-trained frequently in different aspects of their job requirements to allow us to continue to provide our high quality standard of work we offer. Asbestos is the generic term for a number of fibrous silicate minerals. Products made from asbestos cement – bonded asbestos material — include fibro sheeting (flat and corrugated) as well as water, drainage and flue pipes, roofing shingles and guttering. The manufacture and use of asbestos products was banned nationally from 31 December 2003. Breathing in asbestos fibres can cause asbestosis, lung cancer and mesothelioma. Health problems can occur when people are unaware of the hazards of working with fibro and do not take appropriate precautions. All our asbestos work come with a clearance certificate. Our staff are highly trained at identifying and removing all types of asbestos, having attained CPCCDE3014A Remove Non-Friable Asbestos or CPCCDE3015A Remove Friable Asbestos qualifications. Our staff are frequently retrained in order to maintain the highest quality of work and in alignment with Australian asbestos removal standards. Don’t take risks with your life when renovating a property. Get in touch with C4 Demolition today on 1300 C4 DEMO (1300 243 366) or email quotes@c4demolition.com.au to find out how we can protect you and your family. We’ll help to ensure that the roof over your head is safe and secure for many years to come. Throughout the 1900s and even as late as the 1980s, asbestos was the standard in the building industry and was considered a highly versatile and hardy product for use in cement roofing sheets. Its use was hailed as a breakthrough in terms of being fireproof, durable, weatherproof and heat resistant. However, as we now know, asbestos is highly deadly to humans and pets alike. When the product is removed, disturbed or broken down, the fibres, once inhaled, cause irreversible and fatal diseases ranging from mesothelioma, lung cancer, asbestosis and pleural plaques. As such, all asbestos products were officially banned from both manufacture and use across Australia in 2003. For this reason, if your property contains asbestos roofing, you should not try to remove it yourself. If you’re uncertain about the composition of your cement roofing sheets, please contact C4 Demolition immediately and we will speak to you about your options. Use our Asbestos Removal Price Calculator to get a quote and see how much it might cost to remove asbestos from your roofing. How many square metres of asbestos roofing do you need removed? Everyone wants a nice new shiny bathroom when renovating their house, but few know how risky renovating can be if the bathroom was built before the 1990s. Bathrooms were reinforced throughout with asbestos as standard up until the late 1980s. Its use was in fibro cement sheeting in the walls, ceilings and floors, as well as insulating hot water tanks and pipes. As long as the asbestos is not disturbed or cracked, it can stay in the bathroom without harming your family. However, once the asbestos is removed or damaged in any way, the fibres can be broken down and released into the air, where they can be inhaled and cause serious life-threatening diseases for yourself and your family. The diseases, including mesothelioma, lung cancer and asbestosis are fatal. It’s just not worth risking your health for a new bathroom! If you even remotely suspect that your bathroom could have asbestos within its walls or as insulation, do not touch it. Contact the highly experienced team at C4 Demolition, and we’ll discuss how we can help you. Bathroom prices include full strip outs, including flooring & ceilings. If required, air monitoring must be conducted by an Independent Hygienist. Bonded asbestos was used as standard throughout houses in a variety of settings, both external and internal for much of the 1900s. It usually contained less than 15% asbestos mixed with and bonded to a firm product such as cement to create a solid product with the fireproof, weatherproof, heat resistant and durability benefits of asbestos. Bonded asbestos was used in a large number of ways from roofing and shingles to exterior and interior wall cladding, eaves, fencing, around fireplaces and water pipes. Its versatility made it a very popular building product up until the late 1980s. Bonded external and bonded internal asbestos applications, which contain a smaller percentage of asbestos than friable asbestos, should remain relatively safe as long as they are undamaged and securely maintained. Although any deterioration of these products is a health risk for your family and potentially your neighbours. Use our Asbestos Removal Price Calculator to get a quote and see how much it might cost to remove your bonded external and bonded internal asbestos from your home. How many square metres of asbestos do you need removed? Cladding was once a popular way to cover up old fibro cement sheeting on houses and to make them look nicer and more in line with brick houses. Consumers bought into the idea that their house could look as nice as the neighbours’. Cladding was once a booming industry. Unfortunately, however, cladding contained asbestos which we now know is a serious health risk when it’s damaged in any way. If you wish to renovate an old cladded house, you must absolutely not undertake the project lightly. Once cladding is cut or drilled, sawed or demolished, it can release dangerous asbestos fibres into the air, that when inhaled, can cause fatal diseases for anyone who comes into contact with them. It’s absolutely vital therefore that you engage the services of licensed professionals who are fully trained at removing all traces of asbestos. 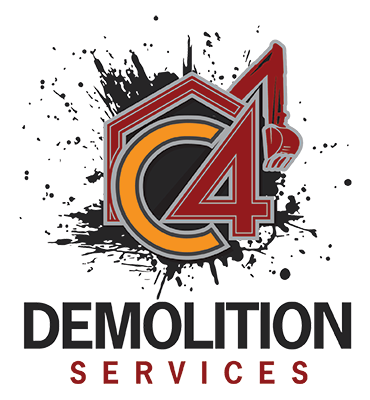 Don’t start your renovations until you’ve spoken with the team at C4 Demolition. Our team is fully trained and highly experienced at removing all types of asbestos, having attained CPCCDE3014A Remove Non-Friable Asbestos or CPCCDE3015A Remove Friable Asbestos qualifications. Get in touch with the experts at C4 Demolition on 1300 C4 DEMO (1300 243 366) or email quotes@c4demolition.com.au so that we can take the risk out of your hands and safely remove all asbestos from your property. We’ll have it removed fast and fastidiously so that you can get on with the rest of the renovations. Use our Asbestos Removal Price Calculator to get a quote and see how much it might cost to remove your asbestos cladding from your home. Friable asbestos was once used in a huge number of applications in and around the home from roofing and spray on insulation to soundproofing, sealants, lagging, carpet underlay, backing materials on floor tiles, and even in heat resistant fabrics like ironing board covers and inside hair dryers. It was everywhere! Until it turned out to be unsafe and was banned from use and manufacture within Australia from 2003. Not only was it unsafe, but asbestos, as we now know, causes fatal diseases such as mesothelioma, lung cancer, asbestosis and pleural plaques. In short, you don’t want it in your life. Often asbestos when left undisturbed, can be fine. It was, after-all, hailed for its durable qualities. However friable asbestos, in particular, being made up of up to 100% fibres, is easily crumbled and can be swept up into the air where the fibres stay for quite some time, allowing them to be inhaled by your family, pets and neighbours. Even bonded asbestos, once cracked or damaged, can become friable and potentially dangerous. For this reason, if you suspect friable asbestos in your home, whether renovating or not, you should get in touch with the licensed asbestos removers at C4 Demolition. We’ll talk to you about your options and help you safely and securely remove all friable threats from your home. Use our Asbestos Removal Price Calculator to get a quote and see how much it might cost to remove any friable asbestos from your home. Asbestos often lurks where you least expect it. It was once commonly used in soffits and eaves around the top of houses as it was weatherproof, fireproof and durable. However as the dangers of using asbestos have become abundantly clear since the 1990s, this practice has ceased. Unfortunately, there are still many houses with hidden asbestos in the eaves and soffits and once cracked or damaged; it can become dangerous and potentially fatal for those innocent family members or neighbours who might inhale the falling or floating fibres. Inexperienced home renovators might only think about the asbestos hiding in fibro cement sheeting, never suspecting they should be careful when removing the soffits and eaves. But be careful you must! In fact, it’s best to leave it altogether to the licensed professionals at C4 Demolition. Use our Asbestos Removal Price Calculator to get a quote and see how much it might cost to remove asbestos from your soffits and eaves. If your fence was made prior to 1990, there is a very good chance that it was made using asbestos. One of the most popular fencing companies, James Hardie & Co made the highly popular Super Six Asbestos fence up until the mid-1980s as it was strong, weatherproof and fireproof. Unfortunately, it’s also since been proven to be deadly. Any decaying or damaged fences and fence caps have since become health hazards due to the potential for them releasing dangerous asbestos fibres into the air. These fibres, when inhaled by unsuspecting residents, neighbours or gardeners, could lead to fatal diseases including mesothelioma, lung cancer, asbestosis and pleural plaques. If you or your neighbour are considering replacing an old fence, make sure that you contact a licensed professional who can firstly identify the type of fence, and secondly remove the fence if it is made of asbestos, using the correct techniques, in accordance with current Australian standards. Use our Asbestos Removal Price Calculator to get a quote and see how much it might cost to remove your asbestos fencing. Is the fencing on your property buried or non-buried? Either way, it can contain deadly asbestos if it was installed prior to 1990, so rather than taking unnecessary risks, contact the professionals at C4 Demolition before removing any fencing by yourself. We’ll assist you in identifying the type of fencing on your property, and if necessary, arrange to professionally remove the offending asbestos fence so that you, your family, gardeners and neighbours come to no harm. Use our Asbestos Removal Price Calculator to get a quote and see how much it might cost to remove asbestos from your buried or non-buried fencing. It lurks in your house everywhere, even beneath your feet. Asbestos was once considered a great idea, commonly found everywhere in houses built prior to 1990. Though it has since been banned for manufacture and use in Australia since 2003 due to its deadly side effects. It was often used as a backing material on floor tiles and vinyl flooring as well as carpet underlay. Unfortunately, unsuspecting home renovators may not be aware of the deadly diseases it invokes when removing vinyl floor tiling. So if you’re thinking about renovating your home, make sure you get in touch with the licensed professionals at C4 Demolition. The last thing you want is to compromise the health of your family when trying to increase the look and value of a property. 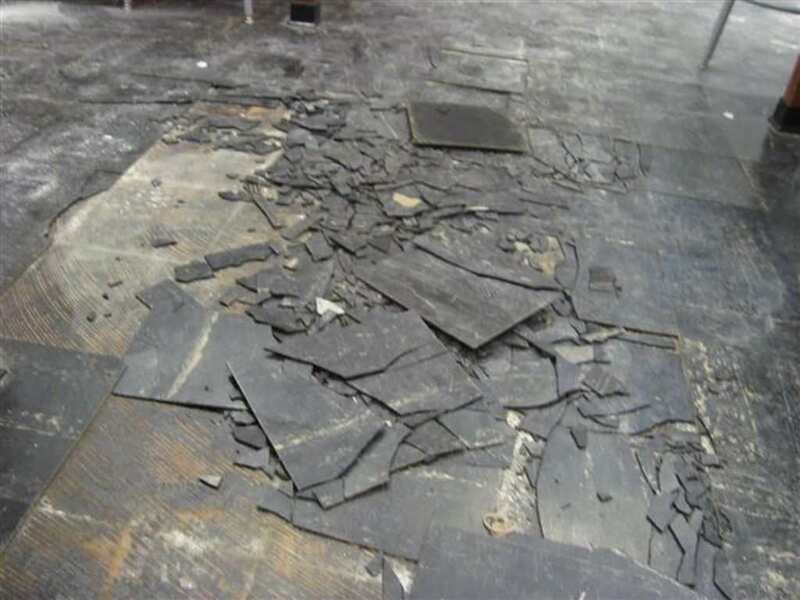 It’s simply not worth the risk of contracting mesothelioma, lung cancer, asbestosis or pleural plaque by trying to tear up the flooring and realising all too late that you should have used a professional. Use our Asbestos Removal Price Calculator to get a quote and see how much it might cost to remove asbestos from your vinyl floor tiles or other flooring. The pricing calculators and estimates has been provided for approximate budgeting purposes only, it is not a formal quotation. Prices are based on standard job conditions, however every project is unique and thus your price may be significantly different than the online calculator predicts. All budgeting estimates are based on works within approximately 50km of our depot in Brisbane. Additional costs should be allowed for works outside this area. All roofing and/or ceiling prices are based on the house having batt insulation or no insulation. If the house contains “cool or cosy” or other “pumped in insulation” the price will be higher. Bathroom prices include full strip outs, including flooring & ceilings. If required, air monitoring must be conducted by an Independent Hygienist. Please phone us on 1300 243 366 to arrange a formal quotation. All estimates exclude independent clearance inspections which are a requirement by law must be conducted on every asbestos job >10m2. We can organise this for approximately $150.00+GST.